Soft and chewy Pumpkin Spice Snickerdoodles blend together all of fall's favorite flavors! In a large bowl, beat together butter, brown sugar, and granulated sugar until light and fluffy. Add the pumpkin puree (not pumpkin pie filling) and vanilla extract and beat to combine. Stir in flour, cream of tartar, baking soda, spices and salt. Cover with plastic wrap and place in the refrigerator to chill for at least 30 minutes, or up to 3 days. Preheat oven to 350 degrees. Line baking sheets with parchment paper or silicone liner, set aside. In a small bowl, mix together sugar and cinnamon. Scoop dough into 1 1/4-inch balls and roll in cinnamon sugar mixture. Place on prepared baking sheets about 2 inches apart. Bake for 10 to 11 minutes until just set. Move cookies to a wire cooling rack and cool completely. Traditional Snickerdoodles spread when they bake, Pumpkin Spice Snickerdoodles do not! For the softest, chewiest texture inside bake them in their original ball shape. For a more traditional, flattish cookie flatten the cookie dough balls with the bottom of a drinking glass before baking. I preferred the texture of the cookies that were made with butter. Feel free to substitute shortening or coconut oil for dairy-free cookies. The pumpkin flavor is not very strong at all, but it does change the texture. 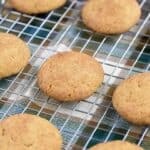 These cookies are much lighter than traditional snickerdoodles. If you do not have pumpkin puree, or just don’t want to use it, substitute shortening for the pumpkin. Everything else stays the same.